This cool watch is one of the great additions you can make to celebrate your car or cars everywhere. Even if you aren’t a professional race car driver, you will definitely love this amazing gadget. If you need help deciding what type of gift you should get someone from your workplace that you don’t know or somebody from your school, there are those generic gifts that make things much simpler for all of us. One of those is definitely this watch and it can prove to be a nice gift for those who have a car as it will become a useful object. The great thing about it is the fact that the only information you need to find out about that person is the fact that they like cars, and who doesn’t? The watch comes with the coolest display that makes the main attraction, two large gauges, one that displays the hours and one that displays the minutes. The watch face is squared so you won’t just get a great design but also get a cool shape. The measurements are approximately 4.1 cm for the watch face diameter and approximately 2.2 cm for the bracelet width. It also comes with two other smaller gauges that are used to tell you whether it is AM or PM and also a nice looking date display. You will get to see the time on a cool LED display that has bright light, so there’s no need to worry when it’s dark and you need to know what time it is. It also has a cool alarm feature so you can make sure that you don’t run late at that date. And let’s not forget that you will surely impress your date with this cool gadget. The strap is also pretty comfortable, made from black rubber, which makes it perfect for those who have metal allergies and it’s also adjustable. It features a 50 BAR water resistance and it is made of stainless steel, making it pretty durable so that you can wear it for ages. The color available is black and the movement is quartz. What are you looking for? 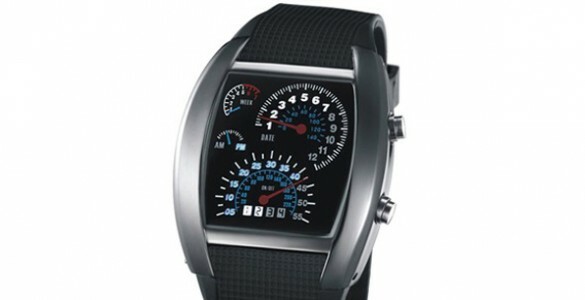 Get your cool Max Speed Speedometer Car Watch if you are a real car fan.